I collaborated with two researchers to implement a convergent parallel mixed-methods study design for a Deep Dive on Instagram. We wanted to understand how people use the app as a tool to represent themselves, create content, and engage with others. We did this as a source of analogous inspiration for the Communications organization at Google, which develops technology to support people’s communication needs. I designed questionnaires for and analyzed data from the experience sampling and diary study parts of the competitive analysis using dscout. We conducted a diary study and series of interviews to capture people’s experiences and understand their motivations for using Instagram. Clusters formed based on frequency of user behavior, such as number of posts to stories. Act as an integral part of the corpus construction by analyzing dairy data to maximize the diversity of unknown representations of user types that would be surfaced in subsequent in-depth interviews. Conduct statistical hypothesis testing on data gathered to understand the likelihood of certain behavioral and attitudinal outcomes. I also provided interview moderators with participant-specific probes based on dairy study data collected. 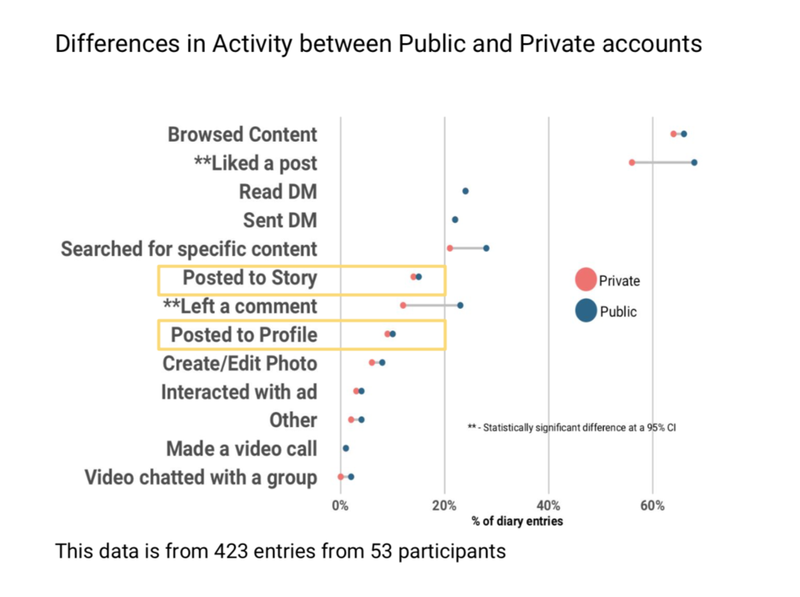 Stacked-bar plot showing distribution of valence for participants who did not post a story within a session(left) and those who posted a story within a session (right). I analyzed the longitudinal data by implementing generalized linear mixed models (GLMM). This allowed me to take into account the relationships both within and across subjects in making a logistic regression classification of outcomes. Respondents who were active on IG were more likely to report a positive mood change. 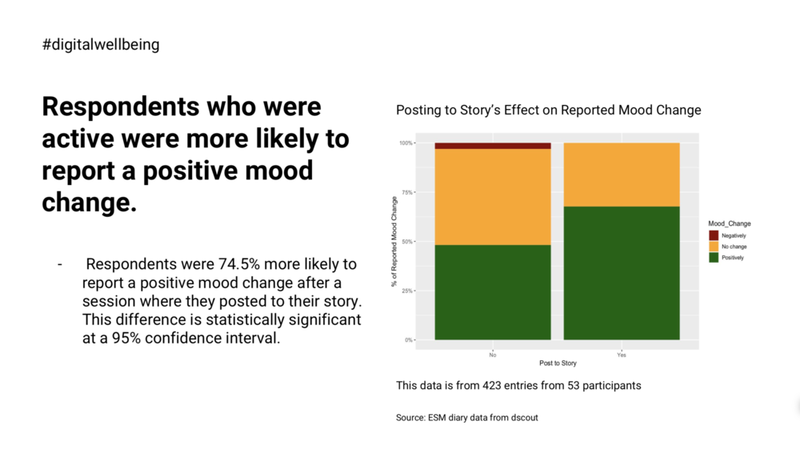 Active behavior like posting to profile and posting to stories evoked positive feelings amongst respondents. This likelihood was most pronounced for active behavior such as posting to their story. Respondents used Instagram's content creation and editing features infrequently. A large proportion of content creation and editing needs, are unmet by Instagram’s features. Posting to stories was the most the frequent content creation behavior. Strong user conventions and etiquette are forming around the best time to share content. Instagram is used during ‘in between’ moments during the day when people want a break. Such as during lunch, during their commute, etc.